2013 International Year of Water Cooperation. 1 Jan New Year's Day. - Make some Green Resolutions. 22 Jan Gloucester Gloucestershire Churches’ Environmental Justice Network meeting 12-2 pm in the Laud Room, Gloucester Cathedral.It will be an Environmental surgery, in which a panel of experts will respond to your questions on any environmental issue you would like to raise – from good environmental practice in the church, to personal lifestyles, to engaging with civic and national policy. The panel members are Mike Bush – Vision 21, Alison Ensor – Permaculturalist, Natalie Hill – Churches’ Officer, Diocese of Gloucester, and Simon Topping – Environment Officer, Diocese of Gloucester and Gloucestershire Methodist Circuit. All welcome - bring sandwiches. How can we connect with the complexities surrounding food globally and locally in a changing world – and still celebrate food as gift? Food Matters is a new project from the Diocese of Oxford to help churches do just that. Food Matters will be launched on Thursday 24th January 2013 at New Road Baptist Church, Oxford (7.30-9.30pm). Get details and register. 30 Jan Truro Environment Book Club - 7.00 pm at Diocesan House, Kenwyn, Truro. (01872) 274351 We shall be studying the book Prosperity without Growth: Economics for a finite planet by Tim Jackson. 2 Feb World World Wetlands Day - The date of February 2nd was chosen as it marks the adoption of the Convention on Wetlands which took place in the Iranian city of Ramsar near the Caspian Sea on 2 February 1971. The UN has declared 2013 the International year of Water Cooperation and the theme for World Wetlands Day 2013 is "Wetlands and Water Management". There will be a focus this year on working with the water sector. This year across the UK the Wildlife Trusts will be holding events to raise the public's awareness of wetland values and benefits and the Ramsar Convention. The UK's wetlands are home to some of our most exciting wildlife, like otters and beavers, and this is your chance to learn more. 2 Feb Giggleswick, Settle, N Yorks Mosses of Giggleswick Churchyard Workshop - Suitable for beginners and people with low mobility. Visit to Giggleswick churchyard (SD 811640) with Dr Judith Allinson. Easy distance and terrain. Please book - contact Judith Allinson 01729 822138 for more details. Britain has a rich Moss flora compared to most European countries. Bring warm clothes. Hand lenses provided. We will learn 10 easy mosses and look some of the other 25 or so species that can be found in Giggleswick churchyard. Participants can obtain the illustrated booklet "Mosses of Giggleswick churchyard"
14 Feb London Helping volunteers love you – your organisation and the role they play Time: 10.00 - 16.00 Talk Action Volunteer Magagement Training at London. 16 Feb nr Oxford Christian Rural and Environmental Studies (CRES) will hold an Open Day at Ripon College Cuddesdon (nr. Oxford) on Saturday February 16th 2013. from 10am - 4pm. With plenty of time afterwards for questions and discussion. 1.15pm (following the 12.30pm http://luminouslincoln.co.uk silent eucharist at Mary-le-Wigford Lincoln LN5 7EQ) Geoff Stratford will introduce a discussion on Lincolnshire’s Energy Future. £2 hot jacket potato lunch. All welcome. A chance to see Friends of the Earth's award winning photo display featuring renewable energy, hear expert speakers on these important issues, meet local renewable energy installers, community energy groups and experts on insulation. The Stream of Life, Saturday 16th March 2013 -Tributaries and trails of thanksgiving, vulnerability and radical choice. Explore with body, mind and spirit the relationship between God, nature and the human. Deepen your discipleship and prophetic practice in church, community and daily life. Oxford Place Methodist Centre Leeds LS1 3AX Cost: £15 (£10 for CEL members). 17 March Harrogate Special Eco-service at St Peters followed by stalls. 9.30am and 11am. includes talk by Jemima Parker, Diocsesan Environment Officer. 23 March World Earth Hour 8.30pm - turn off your lights! What else can you do? 16 Euston We need to talk about consumption - 7-9pm Friends Meeting House, Euston - Join us to talk about consumption, climate change, inequality and the lives we'd like to lead... The event is OPEN & FREE to attend, and will include the launch of a new animation. 20 Apr Exeter A special Climate Communion service will be held at the Justice, Peace and Creation Chapel at Exeter Cathedral on Saturday 20th April at 12 noon, led by Canon Andrew Godsall. 6:30pm Speaker & Supper Evening. Mr Christopher Jones 'The Agriculture and Theology Project' seeking to bring biblical and ethical principles to bear on issues and trends in world farming. At Rugby Methodist Church Centre, Russelsheim Way, Rugby, Warwickshire CV22 7TB. Cost £7.Tickets from Dorn Margetts, tel: 01788 824195, email: DornMargotts@aol.com Last day for booking: Wednesday 17th April. Church goes wild: Drawing workshop at Hurst Green Church near Clitheroe -3pm -Ed Foster will lead a drawing workshop showing us how to draw animals and birds.www.edwardfosterart.co.uk. - The afternoon will be followed by the usual Jacob's Join. 12 May Austwick Yorks Dales Annual Primrose walk - meet at Austwick Church at 3pm - stop for afternoon tea en route. 13-19 May UK Dying Matters Awareness Week - Have you talked to your friends/relatives about any green wishes you have for your funeral? And possessions. Make life easier for your relatives. 24-26 May Hilfield Friary Dorchester Hope out of Chaos - Hilfield Friary, Dorchester - Making sense out of caring for a radically changing World - A weekend led by Andy Lester and Sir Ghillean Prance. Andy is the Conservation Director of A Rocha and Sir Ghillean, a committed Christian, is an eminent botanist/conservationist and a former Director of Kew. The two days will include walks, talks, meditation, exercise and quiet. Time: 7.30-8.30 Spring Flowers of the Ingleton Area – an Illustrated Presentation by Dr Judith Allinson Cost: Donations in joint aid of Rainforest Fund & St Marys Church. Age: Suitable for all Venue: St Mary’s Church Room Join local botanist Dr Judith Allinson for an illustrated presentation of flowers that can be seen in the Ingleton Glens, limestone pavements and on heather areas at this time of year. St John’s Church, Ben Rhydding celebrate Environment Sunday. This year they will have a special Sunday Service at 10 am based on Save our Seas on the marine environment and marine reserves. 15-23 June Bristol Bristol’s Big Green Week, 15-23rd June. Go Green Fair' in Mel Square, centre of Solihull, now in its 4th year- and bigger and better! - Information on energy saving - Renault Twizzy car; solar cinema; lots of stalls and organisations, Fair Trade; bees & bee friendly activities. both on the screen as an aid to our prayers of intercession, and as a display at the centre of our worship. We have found helpful resources at A Rocha's website. Members of the eco-group will be helping lead the worship alongside our Minister. It will be a café style service with L O A F refreshments served. Lecture: The Tree of Life- 6.00pm- Venue: Gresham College - The Rt Rev'd Richard Chartres, Bishop of London (lecturer) - the Bishop of London will explore trees as spiritual, mystical and religious symbols of faith and life. All invited to Operation Noah's Annual Meeting - 10.30am – 4.30pm - St Aloysius Church Hall, 20 Phoenix Rd, Euston, London NW1 1TA Following a short AGM, Operation Noah will introduce its exciting new national campaign asking churches to disinvest from fossil fuels which will be officially launched in the autumn. Come along and help us by feeding in your ideas.- Ann Pettifor and David Atkinson will speak. The afternoon, led by CEL chair, Paul Bodenham, will focus on helping supporters communicate effectively on the new campaign and provide an introductory session for Operation Noah Ambassadors and any interested supporters. Some CEL members will be at the Reclaim the Power direct action camp, 16th - 21st August, in Nottinghamshire, see: www.nodashforgas.org.uk . If you would like to meet up and maybe do something together please email ruthj999@gmail.com. 23-26 Aug Cheltenham Greenbelt 2013 - CEL will be taking part - Would you like to help on the CEL stall? Creation time - A Season to celebrate and raise awareness of creation and the environment. Ecology in Christian Tradition from the early church to today. Talk by Norman Tanner S.J. Professor of church history, Gregorian University, Rome. 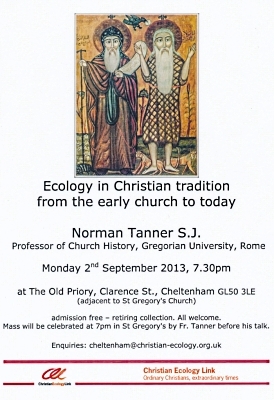 7.30pm - at The Old Priory, Clarence St, Cheltenham, GL50 3LE (adj to St Gregory's Church). Mass will be celebrated at 7pm before the talk. An Eco-Congregation Network for Moray Meeting on Monday 2nd September 2013, 7.30pm at The New Room, St Giles Church, High Street, Elgin, Moray IV30 1LF to explore setting up an Eco-Congregation network in the Moray area! There are already seventeen different Eco-Congregation networks (see http://www.ecocongregation.org/scotland/networks.html) established across the country in areas from Orkney and Aberdeen to Glasgow, Edinburgh, South Lanarkshire and Dumfries and Galloway. Come for one or both parts of the evening. Eco-Congregation Scotland:- Local Networks Seminar 2013 - 11am – 3.30pm in Dunblane Cathedral Halls. The seminar is a great opportunity for active members of our (now 17!) local networks to get together, exchange ideas, learn from each other and discuss issues of common concern. Trevor Jamison, our new Environmental Chaplain, is to lead a session on “Ways of Understanding the Human Role in Creation”. There will be a “Swap Shop”: an opportunity to swap ideas and information with other representatives from networks across the country and discussion of “Members’ Topics” on a diverse range of subjects from plastics to greening lifestyles and growing Eco-Congregation membership locally. 10 Sept Perth, Scotland Perth Eco-Congregation network: Trevor will speak on “the Environmental Imperative for Christians”. It is planned to invite all local churches, whether or not they are Eco-congregations. This autumn sees the launch of a significant new programme of work at St Ethelburga's. Re-imagining the Sacred is an inter-disciplinary exploration of some of the most critical issues of the day, and seeks to re-think how we relate to economics, envrionment, food, education, conflict and more. It includes 7 public talks and an action learning group that travel a 10 month journey together going deeply into the themes. We have started the process of building an online bank of resources to accompany the series - we'll be recording all the events and researching articles, videos, organisations and active tools that can make the thinking behind this series available to a wider audience. Why not sign up for the action learning group, or come to the launch event on Wed 11th Sept? East Lothian Eco-Congregation Network Meeting. 7.30pm at Yester Parish Church, Main Street, Gifford EH41 4QH, when the Reverend Trevor Jamison, Environmental Chaplain, Eco-Congregation Scotland will be giving a talk about “Looking at the Bible through Green-Tinted Lenses”: reading the Bible as an inspiration for environmental action. There will also be an opportunity to see and hear about Yester’s biomass boiler and there will be a short time in the meeting for “network business”: planning a programme for 2013-14 and looking at ways of encouraging new congregations – and each other. Equinox ritual and shared meal. Close to the four solar festivals of solstice and equinox, Mid Wales Forest Church focuses on ritual and celebration; a deliberate, sacred pause to mark the turning wheel and to share food and friendship. 7.30pm at Burnside Building of Burnside Blairbeth Church, Church Avenue, Rutherglen, Burnside G73 5BX, when the Reverend Trevor Jamison, Environmental Chaplain, Eco-Congregation Scotland will be giving a talk about “Looking at the Bible through Green-Tinted Lenses”: reading the Bible as an inspiration for environmental action. The environmental movement and immigration. If you want to book onto any of the events, please just email me. If you know of other people who might be interested, please forward the details to them. Project Manager: UK Climate Change and Migration Coalition. We exist to challenge the lack of long-term strategies to support and protect people at risk of displacement linked to environmental change. Mon 30 Sept Carlops Soil Structure – talk by Dr Bruce Ball – SRUC – Monday 30th September in Carlops Church at 7.30pm (the Eco-Congregation Esk and Tweed Network’s meeting)-Dr Ball’s interests are in soil physics, particularly soil structure and soil gases.- Alongside colleagues, his research currently involves investigation of how organic farming, dairy farming, crofting, tillage and compaction influence greenhouse gas emissions and soil quality.- He is also interested in the spiritual and ethical connections between soil, agriculture and communities – with a view to improving food security by empowering farmers. A series of talks on the most important issue of our time. 14-20 Oct World Could you take part in or organise a vigil against Corruption? see Exposed Campaign supported by Micah challenge, the bible society, World Evangelical Alliance and others. ECCR’s Open Debate 2013 is highly topical in view of the recent issue about the Church of England Pensions Board and Wonga which became a lead story on the national news over the summer. Delegates will have the opportunity to discuss the issue with panellists from the Church Investors Group, Operation Noah and Methodist Tax Justice Network. ECCR will be launching the yourfaithyourfinance website and our three year project Ethical Money Churches at this event. Thursday 17 October; 4.30-6.30pm; Friends House, 173 Euston Road, London, NW1 2BJ. Contact Helen Boothroyd to book a place: 07503 931172. "Rising Tides : Climate Change Challenges and Mission". Participation from local environmental groups. 23 Oct Settle One World Week talk by Alex Jones of Christian Aid organised by Churches Together in Settle at Settle Methodist Church Hall 7: "More than enough.."
23 Oct Heading-ton Quarry Oxon “Saving Paradise” – Talk by Revd Paula Clifford 8:00 pm - 9:30 pm Holy Trinity Church, Trinity Rd, Headington Quarry, Oxfordshire OX3 Free talk as part of Holy Trinity, Headington Quarry’s “Earthing Faith” initiative. All welcome. Paula Clifford was formerly Head of Theology at Christian Aid and the Archbishop of Canterbury’s adviser on climate change. She is the author of Angels with Trumpets: The Church in a Time of Global Warming. 6pm - Venue: Huxley Lecture Theatre, ZSL London Zoo, Regent's Park, Outer Cir, London NW1 4RY - Cost: £9 plus £0.90 booking fee. (or £10 on the day if there is space) Includes light refreshments and half-price entry to the zoo on the day. Fossil-free tour. As part of this campaign, Operation Noah is working with the student group People & Planet to organise Bill McKibben‘s tour of the UK. Desmond Tutu, Naomi Klein and others will also be speaking and the show will be an inspiring mix of music, art and discussion. If you invite your fringe green friends to anything this year, this is the thing to invite them to! Banchory West Church:Prof R.J. "Sam" Berry to talk on on "Whose World? Who Cares?" ‘A Way of Life: Sustaining discipleship for a fragile planet’. Some CEL members observe a rule of life. It is their covenant with the earth and with others to seek to live according to God’s design. Hear from members of various communities how a rule of life helps them ‘keep on keeping on’. There will also be opportunity to consider what form your own life might take, whether you are new to the idea of a rule or not, and how CEL can support you in fulfilling it. This may lead to CEL creating our own distinctive rule or ‘Way of Life’. Why Should We Care For God’s World? Alternative Economics Seminar organised by Transition Buxton. a day of talks and workshops run by experts. Questions being addressed include: Why is the economy in such a mess? ; Is perpetual growth essential? ; Can it be sustainable? plus workshops on Zero Growth, Local Currencies, Steady State Strategy and Participatory Budgeting. Free admission, donations accepted. Refreshments provided, 'bring and share' lunch. We are delighted that George Lings, the Church Army’s Director of Research will be joining us for the day. He and our very own Ruth Valerio will be leading inspiring meditations around the theme, ‘The Sacred Spaces that People Occupy.’ We will also enjoy a great lunch together and there will be time to take in the beauty of this project. Places are limited so if you would like to come, please contact our Office Manager, Maria Masih, on 0208 574 5935 or by email. The Food Matters conference on food security in the developing world features two keynote speakers: Patrick Mulvany Senior Policy Adviser for Practical Action – main focus agricultural biodiversity for food and work security; and Dr Michel Pimbert, Director of the Centre for Agro-ecology, Coventry University, has worked with the International Crops Research Institute . Also: four workshops led by NGOs : Action Aid on tax avoidance; Cafod on small farmers; Christian Aid on land grabs; and Oxfam on transparency in company/governments dealings – (IF campaign topics). Lunch 12.30-2.00 may include a video or skype from Mindanao with which Cheshire has strong connections. Venue: Best Building, Chester Campus, University of Chester. Sat 16th November 10am-4.30pm. £10 including lunch and refreshments. Ann Pettifor - Just Economics , the international economist, who predicted the financial meltdown of 2007, with others at the New Economics Foundation, in" Real World Economic Outlook" in 2003 and again in her own book "The Coming First World Debt Crisis" in 2006, is talking about Just Economic's at St Mark's Church, Broomhill on Saturday, 16 November from 10 am to 3:30 pm (cost £14 but students and unwaged £5). Many will remember her excellent talk at the Cathedral in 2009. In relation to the current financial crisis, Ann argues that the austerity measures are not needed, will not work and are undoubtedly unjust. She is saying that the economy must serve human need rather than human needs being sacrificed to a one eye and amoral view of economics. She shows convincingly how we can make the economic system work to serve the needs of our society and our world, including dealing with the pressing challenges of climate change. Book at St Mark's CRC, 4 St Mark's Crescent, Sheffield S10 2SG. Phone (0114) 266 3613, or turn up at the door. the climate impact of their fossil fuel investments. 1 Dec Northallerton Zion URC Church - Advent Service with environment theme. 14 Dec Outside St Paul's, London 2pm - not a cel event, though some cel members may be spotted - In 2014 the Church of England considers Fossil Fuel divestment. To celebrate we will be performing our own Fossil Free nativity play on the steps of St Pauls, London. Boxing Day 9.30am Eucharist at Ripon Cathedral and Pilgrimage to Fountains Abbey, led by Bishop of Ripon and Leeds - Walk of about 4 miles,through beautiful scenery, carol service at Fountains Abbey at the end. Number of events recorded in previous years. Tell us of more events.